This week guest post is by Paolo Rigiroli, author of Quatro Fromaggio and also guest of our event in early September here in Turin! Paolo was born and raised in Italy where he took his M.S. in electronic engineering and biomedical technology. A scientist at heart, he turned food blogger after moving to Vancouver where he has been living since 2001. I didn't grow up eating truffles - as a child I only experienced a whiff of them in restaurants when a truffle dish was ordered by somebody seated at my table. And I can't say that I loved it. As an adult, however, I had a chance to rediscover and develop a palate for them. But my love for truffles totally bloomed during my latest trip to Tuscany and Rome. Being truffles season, most restaurants were featuring truffle dishes, so I finally had a chance to try them in different preparations within a short period of time - an amazing experience! 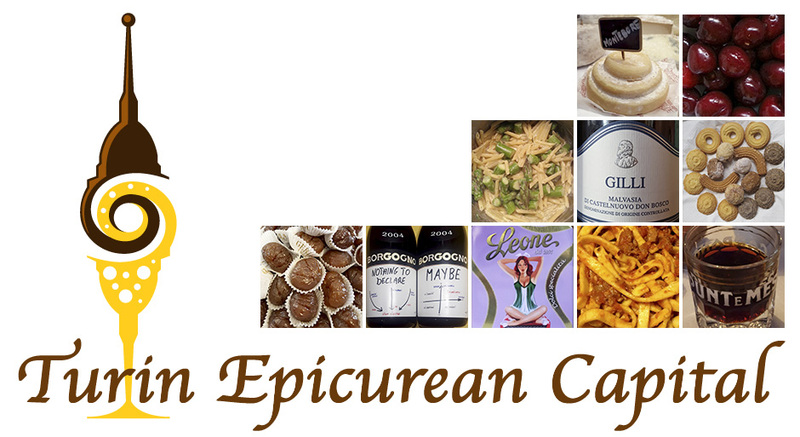 When I was invited to prepare a guest post for Turin Epicurean Capital I immediately thought of truffles, as the Piedmont region happens to have the best in the world. My research for this article has been fascinating, and I managed to answer questions that I have always wondered: what gives truffles their characteristic aroma? Why do people use pigs to find them? When is their harvesting season? I also wondered: can I actually buy them in Vancouver? And the answer to this last question is: yes! I was able to get a gourmet supermarket to special order a single black summer truffle, which is what is in season right now and, luckily for my wallet, one of the most affordable varieties. You can see it showcased in the pappardelle dish above (for which you can check out the recipe at the end of this post). But what are truffles? They are a unique kind of mushrooms that develop entirely underground, attached to tree roots, and which may be of great commercial interest due to their high demand and relative scarcity. Like their tuber relatives, truffles are dense, rounded masses usually between 1 and 4 inches in diameter. In order to spread their spores, truffles produce pheromones that prompt animals to uncover and eat them - a behavior which has been exploited by truffle hunters who have traditionally made use of pigs to locate them. Particularly, truffles contain androstenone, a steroid also produced by boars when mating. Dogs can also be trained to search for truffles, with the advantage that they can be taught not to eat them upon discovery! Flavor-wise, truffles are an acquired taste, containing several sulfur compounds which may resemble hydrocarbons (e.g. : bis(methylsulfanyl)methane), and because of the presence of androstenone, which has an unpleasant smell described as woody/musky, to sweaty/urinous . Even though a portion of the human population is unable to detect it , there is evidence that repeated exposure to androstenone can cause sensitization , leading to the conclusion that androstenone largely contributes to making truffles an acquired taste. Truffles have been known since antiquity, with written evidence as early as in the 4th century BC. The Greek historian Plutarch thought that they were the result of lightning, while the Roman physician Dioscorides classified them as tuberous roots. Rarely mentioned in the Middle Ages, truffles became popular within the high classes during the Renaissance (legends say that they were a favorite of King Francis the 1st of France), and through the 18th and 19th centuries their prestige kept increasing in high-cuisine. Truffles only grow in very specific climates, in symbiosis with the right host trees. Because of this they are very hard to cultivate with the most sought after demanding exorbitant prices. Most valuable is the white truffle (Tuber magnatum), especially the one found in the "Langhe" region (located in the Piedmontese provinces of Asti and Cuneo), but that can also be found in some parts of Tuscany and in central Italy. White truffles grow on the roots of oak, poplar, hazel and beech trees. White truffles mature in the fall, which is when the famous "Fiera del Tartufo" (Truffle Fair) of Alba takes place - a prestigious exhibition and trade show born in 1929 where the best white truffles can sell for over $400 per ounce. White truffles have a pungent, slightly garlicky aroma, and are best appreciated raw, freshly shaved on dishes before serving. The second most valuable truffle, is the black (winter) truffle (Tuber melanosporum), found in the hazelnut and oak forests in the Périgord region of south-western France. These truffles are harvested in fall and winter and have a delicate earthy flavor, which is known to be enhanced by light cooking. Another notable truffle is the Burgundy (Tuber uncinatum), which has an intense hazelnut flavor. It can be found in much of Europe and it is harvested in fall and winter. The Summer truffle (Tuber aestivum), instead, is harvested in the summer - it is molecularly identical to the Burgundy truffle, but has less intense flavor due to environmental factors. Given the high price that truffles can reach, cooks often make use of truffle oils, pastes, butters, or even flour. Since oil-soluble bis(methylsulfanyl)methane can be easily synthesized at low cost, truffle-infused products are often completely artificial (also lacking any androstenone flavor, resulting in increased palatability for those who haven't acquired a liking for it). Risottos (often together with porcini mushrooms). Various pasta dishes (especially egg pastas, such as tagliatelle, pappardelle or maltagliati, generally along with a butter, cream, or mascarpone sauce). Truffle omelets (for a stronger truffle flavor, the uncracked eggs can be kept in an airtight container along with the truffle for a couple of days before use). Costolette alla Valdostana (cutlets as made in the Aosta Valley, located in the western Alps). Sauces to pair with meats, including beef tenderloin. Truffle dishes are often accompanied with medium to full body red wines, sharp enough to cleanse the palate of the sulfurous notes, and aged enough to develop a matching earthiness. E.g. : white truffles with Barolo, Nebbiolo, Barbaresco, or Dolcetto d'Alba; black truffles with Burgundy or Pinot Noir. "Tartufo bianco" - (white truffle), consisting in "fior di latte" (cream) and coffee gelato, sprinkled with white chocolate shavings. "Tartufo nero" (black truffle), which consists in chocolate and "fior di latte" gelato, covered in unsweetened cocoa powder. 1) Bring a large pot of salty water to a boil. 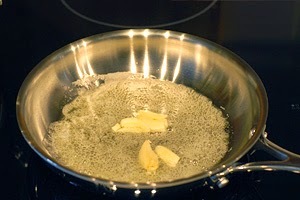 2) In a skillet, melt the butter at low heat, add the garlic and allow it to soften without browning (pic. 1). 3) Remove the garlic, add the cream and bring to a gentle boil. Sprinkle with grated nutmeg, adjust salt and pepper. 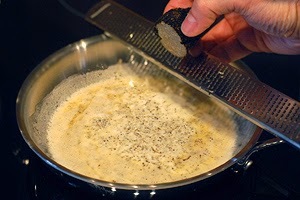 4) Using a sharp grater, grate half of the truffle directly into the skillet (pic. 2); remove from the heat and let rest. 5) Cook the pasta for 2-3 minutes (if fresh) or 5-6 minutes (if dried). Then drain it quickly and add it to the skillet with the truffle cream. Toss gently until the pasta is uniformly coated. 6) Using a truffle slicer or a mandolin, thinly slice the rest of the truffle. 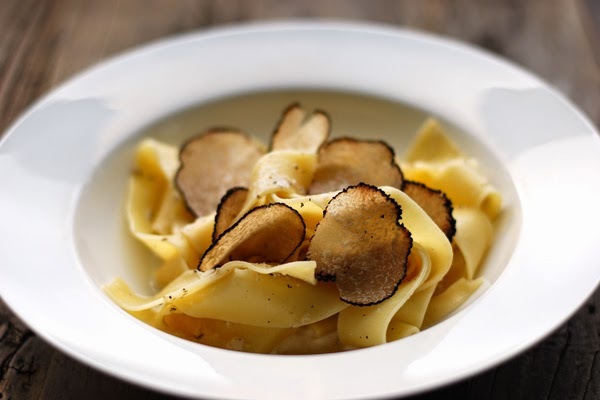 7) Serve the pasta in preheated bowls, and lay 5 or 6 truffle slices on each portion. Optionally, sprinkle with freshly grated Parmigiano Reggiano. Androstenone belongs to the urinous and musky primary odors (http://chemse.oxfordjournals.org/content/2/4/401.full.pdf+html). Recent studies estimated that only 6% of adults can't perceive its smell (http://chemse.oxfordjournals.org/content/28/5/423.full). An increase in the percentage of individuals who can perceive it (http://www.ncbi.nlm.nih.gov/pubmed/2813372/). Hi everyone, it has been a pleasure and a big honor to contribute ‎a guest post for this fantastic event, I hope you found it interesting. Looking forward to meeting you in Turin!